The Khoisan, who were the first known inhabitants of South Africa were mainly hunters. Agriculture was introduced to the country by the black people, who grew, sweet potato, squash and maize for their dishes. Later, the Europeans immigrants brought fish, sausages and introduced vines for wine, which changed the landscape of South Africa in wonderful ways.The Indian and Malaysian slaves imported into the country, added curry and spicy flavorings to the melting pot. The search of food was actually what shaped modern South Africa. In the mid 1600s, the Dutch East India Company was drawn to Java in search of spices. The need for a stopover halfway through the journey brought the Company to the Cape and impelled them to plant a farm at the tip of Africa. This farm changed this region forever. The Company realized it was easier and cheaper to bring thousands of slaves from Java to work in the fields in South Africa than the local people. The Malay slaves brought with them their cuisine and till today is probably the best known of all South African cooking styles. This kaleidoscope of food and cooking styles shows what an incredible rich and delicious history South Africa has had. Today with it’s colorful range of cuisines, South African food provides a flavor, an aroma, a dish for anyone keen to discover more about the food of South Africa. Bobotie is very similar to shepherd's pie – only better. Declared as the national dish of South Africa in 1954, Bototie has a varied heritage. Ground meat was brought to the country by the Dutch while the spices were introduced by the Indonesian slaves. Bobotie uses a lot of flavors from the spice cupboard - cumin, coriander and turmeric all spice up the mince. Chutney, almonds and sultanas add a delicious fruity sweetness and the masala, which includes dried chillies, peppercorns, ground ginger, cloves, cinnamon sticks and cardamom pods, gives it a slight fiery note. Finally it is topped with a savory custard instead of mashed potatoes. Heat the butter in a saucepan and sauté the onions until soft. Set aside. In a large non-stick frying pan over a high heat fry the ground beef, without any oil, until golden brown. Remove from the heat and add the onions. Mix in all the other ingredients – spices, herbs, dried fruit, nuts and chutney - except the milk and eggs. Stir to mix everything well and put into ovenproof bowls or a large ovenproof dish. Press the mixture down with the back of a spoon to even the mixture out. Lightly beat milk and eggs together, then pour over the mince mixture. Bake for 20–25 minutes for small individual boboties and 30–40 minutes for a large one. The topping should be set and golden brown. The first time I had bobotie was a few years ago, when a South African friend from Pretoria cooked up this delicious meal. She served it with turmeric rice and a banana chutney. When Tom heard what she was making that evening – he looked at me and said “Should I eat a Wiener before we go?” expecting the wild fusion of flavors not to appeal to his palate. But boy was he wrong! It tasted incredible and I asked for the recipe. She wrote it down for me in her neat handwriting and it is this recipe I share with you. I served this bobotie with saffron rice and chunky mango chutney. The perfect meal! Unfortunately I lost all contact with my friend I., who moved back to Pretoria – the last I heard from her was an email telling me how she loved living out in the South African wilderness, building a tourist resort with her own hands and watching her little boy play with the monkeys. I wonder if she realizes the impression her bobotie left on us. 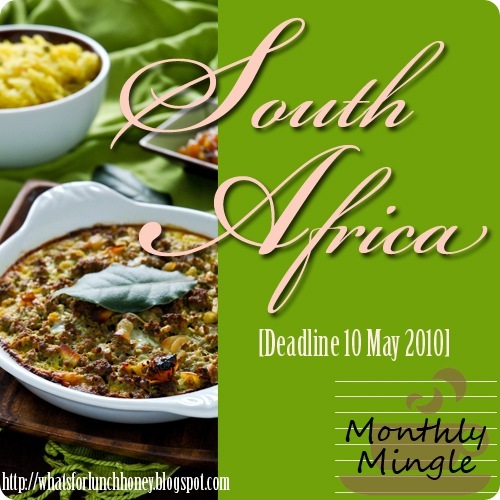 The Monthly Mingle this month is focusing on South African food and I am hoping everyone will come over to celebrate this incredible cuisine. There’s still plenty of time as the deadline is on May 10th. I’ve been getting some incredible entries and can’t wait to share the food with you. Just 30 days till the Food Blogger Connect this June 5-6. Can you believe how fast time flies? Well if you have not already please take a moment and check out the exciting itinerary, then see who’s speaking, then check out the lavish location and finally – BOOK THOSE TICKETS! I hear there are only a few left. I’d love to see you all there and hope you will enjoy the photography session, where Bea, Mowie and myself are teaming up to present you with a few great topics on Food Photography and Styling and live demos. yumm Meeta! love it .. i can just imagine the wafting aromas from all the spices! can I get a bite please?! That is a speciality I really love! Your Bobotie looks scrumptious and your shots are lovely! That is so delicious. Can you suggest an alternative for the baking part? This looks marvelous, thank you for sharing! Banana chutney...that sounds great with it too! Beautiful dish and with wonderful recipe.. Love the click of the flower and offcourse the platting too..
Great looking bobotie! Gotta see if I have time for a good south african dish before the 10th! Thanks for introducing me to South African cuisine. What gorgeous photos! Ho, ho! If I got a package like you, there would be no sharing either. Probably a lot of closet munching, as my kids are always curious to try something new! My husband would have probably asked the same question too. I have yet to dive into south African food. This sounds delicious. Hello Meeta...first time on your foodie platform. I have yet to cook anything South African. The ingredients seem quite flavourful...I might just give this cuisine a try. Really interesting and gorgeous photos as well! I love the color composition in this photo. Great job! Yum! I ate bobotie all the time during the year I lived in South Africa and haven't had it since! If I remember correctly, there was often a bit of cocnut in the mix too, when my friends would make it. I am totally going to have to make this version. Yours looks amazing! This looks amazing! I still plan on making this at some point in my life...too good to pass up. Fantastic -- I've heard of bobotie but never knew exactly what it is! I'm so thrilled to have this recipe, especially as it uses some of my favorite spices from my spice rack. one of my favorite foods.... I usually stick a couple of lemon leaves instead of the bay leaves into the babotie before cooking, infuses a wonderful flavor. I made bobotie a couple of years ago, and it was a favorite on our menu for awhile, but I had forgotten it until this post- thanks for reminding me of a delicious dish! Bobotie is divine! if only my South African Husband would agree! I have never put Garam Masala in mine....and we usually have it served with plain rice with sliced banana at my Mother-In-Laws! Wow, this looks good! I've been considering South African cuisine myself lately - since the World Cup is coming so soon! Love this dish, will definitely have to try it. Bobotie really shouldn't be fiery at all - it's a mellow, fragrant dish. We never use garam masala; just cinnamon, turmeric and enough mild curry powder to scent it. Even though mango chutney was certainly endemic growing up, the choice was generally either apricot chutney or apricot jam. I've also never known anyone to use garlic or mixed herbs. We do start with sauteed chopped onions though, contributing to the mellow sweetness. My mom always served it with chutney, chopped onions and tomatoes, sliced bananas in lemon, and desiccated coconut (not the nasty sweetened, soggy stuff in the US). This recipe sounds very tasty, but it's a far cry from any of the recipes we grew up with - a tweaked haute cuisine version of the recipes you'll find in any of the "church ladies" type cookbooks. Kinda the same, but not entirely authentic IMO. Thank you all so much for all your comments and feedback and so glad you are enjoying the recipe. Charlene - thanks for your feedback on this. No this is not a traditional Bobotie but I never said that but all the recipes on my blog are my own interpretations unless otherwise stated. Most of my readers know that. I would not exactly call it haute cuisine in any sense. This recipe is actually from my SA friend who does use garam masala in her bobotie as it contains all the spices she would otherwise add individually. As a matter of fact the recipe was given to her my her SA grandmother. But it's great to know how you enjoy your bobotie. Thanks for sharing! wonderful, interesting and informative post. i'm so very hungry now. I love the history lesson, Meeta! :-) I never cease to be amazed how some good (amazing food) comes out of even horrible things like slavery. What a beautiful dish. :-) The chutney would be perfect with it!! Stunning - thanks for sharing our beautiful country with the blogging world. Meeta, thank You for the excellent recipe! I made this dish for dinner. Yummy! I liked it very much..great photos..
Just came across your blog and am greatly intrigued. One point in this article pique my curosity.You have capitilize all the races; Khoekhoen. Malay,the Dutch, the Europeans etc.. but when you mention the black people - it is not . Why? Are they lesser than the other and do not deserve the same grammtical reverence? To me the Khoekhoen, bush people are indeed Black /Brown people. Just a thought! Thank you for hosting this wonderful mingle. Your Bobotie looks amazing. You are quite lucky to get such a fab goodie bag. I enjoyed reading all of the recipes and finding new and fantastic blogs that I hadn't previously heard of. I look forward to June. Uhmmmm, I haven't cooked Bobotie for many, many years....time to make it again! 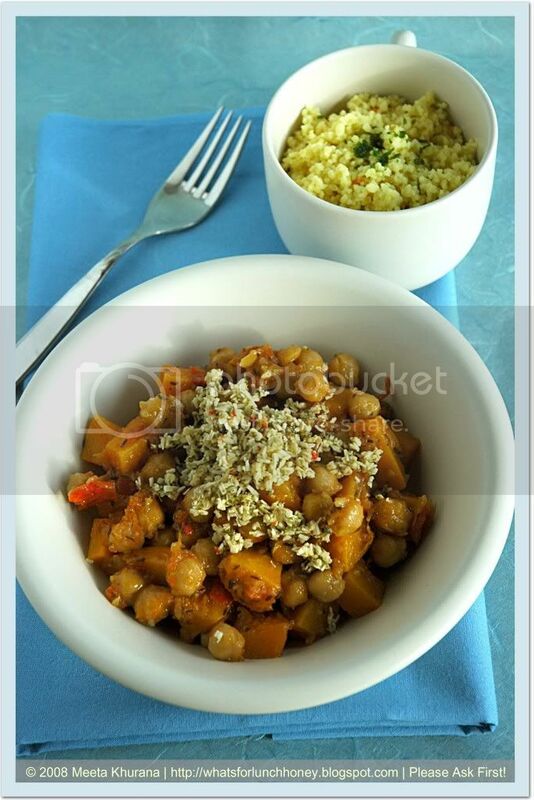 Your version sounds delicious, had never used almonds or apricots when I cooked it, but I like the idea! The photos are brilliant too.